The Sorrows Chronicles continues with the story of two conjurors--a young mage, Carol MacAlister, and a seasoned Witch, Julian Machliec. 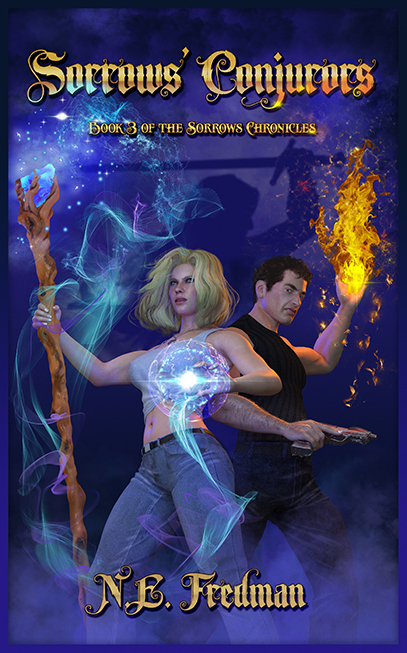 Journeyman mage and computer geek, Carol MacAlister, thought sharing her groundbreaking magical research project with Terry, the cute guy-mage, wouldn't be such a big deal. At least, not until Terry sees an opportunity for advancement in the new Mages' Guild. He wants to wrest her secrets from her, to give her invention to his master. But Carol's no pushover. She gets away, but she knows that mages never give up. Her master is away, and she needs help. Via Dark Web gossip on MageNet, she seeks help from the new swordbearer, Alex Gotth, and his soldiers. But Carol's got a demon after her, sent by the Archmage of the Mages' Guild, and they all seek advice from Alex's contact at the Burea for Paranormal Affairs, one Julian Machliec. Julian, a Witch very much in the closet in more ways than one, is also on a job to find out who has been sending an infernal Beast that murders mages who refuse to join the Mages' Guild. They never expected their cases to collide with a boom. Sorrows’ Conjurors AND a Novella Now Out! Want to hear more from the characters themselves? Go to their blog on Mage Net!